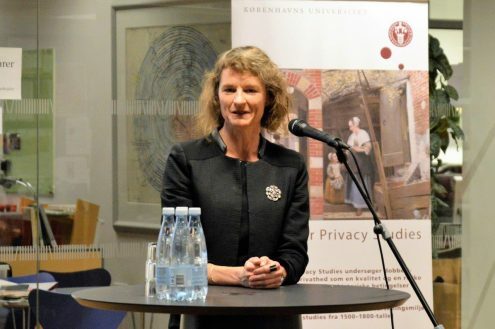 The new Center for Privacy Studies was celebrated with speeches, a reception, and a tour of the newly established office space at the University of Copenhagen on November 1. The center is one of ten new Centers of Excellence that received a grant in the 9th application round. The center is hosted by the Faculty of Theology and headed by Professor in Theology Mette Birkedal Bruun. Schools of Architecture, Design and Conservation and political history at Lund University, Bruun will explore the origins of this dual notion in early modern Europe (1500-1800). In her speech, Chair of the Board of the DNRF, Liselotte Højgaard, warmly congratulated Bruun on the new Center of Excellence and expressed her high expectations for the original research that is to be conducted by the interdisciplinary team. 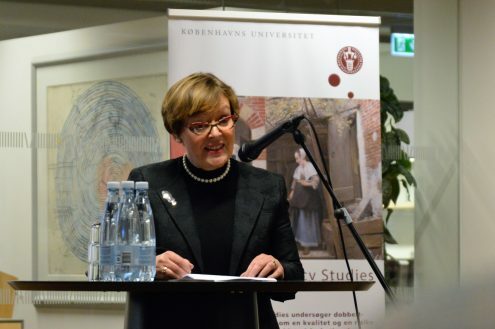 Dean of the faculty of Theology, Kirsten Busch Nielsen, expressed her pride at the fact that the faculty would again be host to a Center of Excellence. Rector Henrik C. Wegener, using the musical theme “learning to fly,” thanked Bruun for showing the university the way.